Experience the exhilarating thrills of getting shot out of a cannon with none of the bone-crushing injuries in Ongoz’s Circus Pain. The 2D physics puzzle game for the iPhone, iPod touch, and iPad puts you in the star-spangled boots of Igor, a circus performer with a talent for getting flung out of a cannon and smashing everything in his path. Your mission: Control the angle and the thrust of Igor’s cannon to allow this human cannonball to fly through a series of obstacle-ridden puzzles so that he can land safely in a waiting net—though not too safely, as you also rack up points for inflicting damage on poor Igor. It may sound a lot like Angry Birds, the monstrously successful physics-puzzle game for iOS devices, or even Ragdoll Blaster. But even if Circus Pain doesn’t break new ground as easily it breaks Igor’s bones, the $1 game is still a lot of fun—though it may involve too much trial-and-error problem-solving for some gamers’ tastes. No Pain, No Gain: You progress through Circus Pain by bouncing the human cannonball off various targets and onto a white safety net. Racking up damage along the way also scores you points. 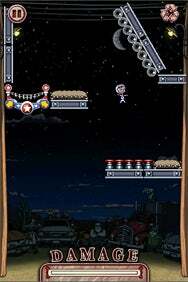 Circus Pain features 55 levels in which you must bounce Igor off walls, plastic bubbles, electric fences, and some other painful surfaces to reach his target. No level of the game feels the same as the one before it, thanks to unique obstacles on every level. You might have to bounce Igor off a series of balloons so that he can properly reach a white net, or you may have to shoot Igor through a set of robotic boxing gloves. (As noted above, you score points for Igor’s pain, though I had a hard time figuring out the method behind the scoring madness.) This variety keeps things interesting and challenging, though it also means the knowledge you pick up on one level won’t really help you later on. And that’s probably the most frustrating aspect to the game. You’re rarely ever going to shoot Igor out of cannon perfectly on a first try, so Circus Pain can feel a little repetitive as you try and try again on each new level. Some gamers might appreciate that challenge, and to be fair, no level requires an off-putting amount of retries. In fact, I was able to work my way through the whole game in a few hours. In my testing, I noticed a minor bug. Occasionally, the cannon’s thrust meter, which controls Igor’s speed when you blast him toward the target, disappeared from the screen. You can’t fire the cannon without a thrust meter, so I had to restart the level whenever this bug cropped up. That aside, Circus Pain is an enjoyable, slightly sadistic, game. Though it makes you rely a little bit too much on trial-and-error reasoning, and suffers from a minor bug, those factors barely get in the way of its overall enjoyability.